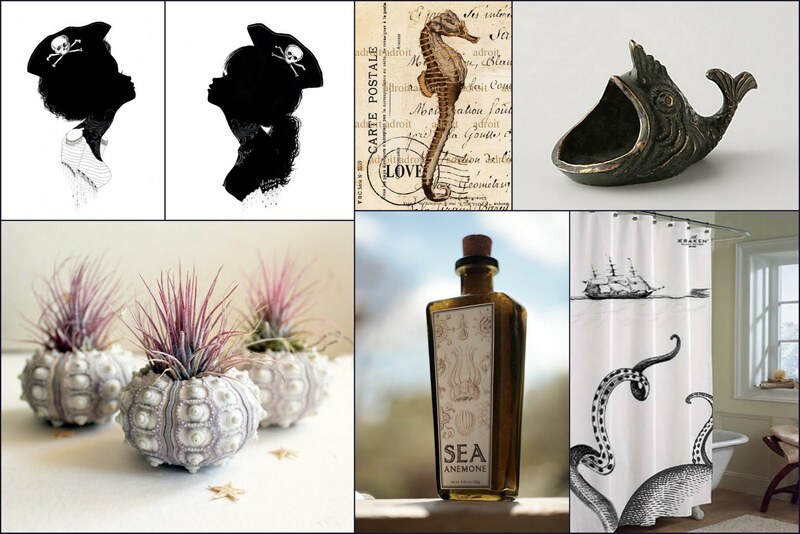 Clockwise: Prints from Charmaine Olivia; Sea Horse print from Louis Adroit; Gulping Guppy Ring Dish from Anthropologie; Kraken Shower Curtain from Kraken Rum; Sea Anemone Bath Salts from For Strange Women; Set of 3 Sea Urchin Air Planters by RobinCharlotte. It's so going to happen. Pictures? In the bathroom. I don't like it. It's weird. Why? You don't go in there to look at the walls. Yeah, but you spend time in the bathroom. So, doesn't mean I want to look at the walls. Well, the pictures are hot pirate girls. I was recently in Old Alexandria with some friends while on a research trip. On one particularly hot and disgusting day we were wondering around, darting from one air conditioned shop to another and trying to eat our cupcakes before the frosting melted off. We wandered into this lovely home decor shop, European Country Living. I am not one for country decor, but I am one for down stuffed ticking sofas (Yes, please!). While taking photos of things I liked and sending them to Tony, we of course disagreed on what was going to be allowed to enter our abode. After much negotiation we decided to invent our own decorative style, "British Explorer." British Explorer consists of lots of dark wood, fairly simple pieces (and, fingers crossed, some sentimental antiques) accented by the odds and ends we plan on picking up along our travels. Sounds pretty awesome, right? I'm hoping that this means that the Moroccan wedding blanket I am dying for (sequins! ), which Tony has no interest in, will become acceptable if we actually go to Morocco and get one ourselves. How awesome will my bathroom be? Yes, incredibly awesome. I'm still unsure of what bath towels to go with but I figure since my bathroom does not yet exist then I'm probably ok for now. On an unrelated note, I feel like everyone has cute blog pseudonyms for their significant others, "DH" for Darling Husband (Tony would barf if he heard that one), "The Dish" "Dear Husband" &tc. Maybe I should just cal him "The Engineer"? Yet that is so boring, and he is so not boring. What dilemmas.